For service-intensive organizations in highly-competitive sectors, such as finance, insurance, healthcare, and retail, it’s no secret that customer relationships are key to long-term success. Yet, no matter how close companies’ relationships are with their customers, they’re not family. Unlike family, the less your customers have to see you, speak with you, or interact with you, the more they like you. Your customers do need to interact with you, but they want to do it on their own terms. And herein lies the challenge for today’s service-minded organizations: providing the level of personal interaction that customers demand while still safeguarding the elusive bottom line. There’s no way to put this gently. The traditional call center is not, nor will it likely ever be, a profit center. It maybe written off as simply the CoDB (Cost of Doing Business), but a cost it will remain. Digital 1.0 provided basic digital self-service, but in a ridiculously siloed manner. Every time a customer tried to move from one channel to another, such as from web site to call center or from application to social media, she or he would end up right back at the beginning of the process. It was the customer service ‘Circle of Death’ and a great way to ensure dissatisfied customers just waiting for the right attrition opportunity. Resolving issues quickly makes for happier, more satisfied customers. But not only are these customers more satisfied, they’re also a captured audience who have already engaged with the organization. This is the company’s chance to pitch additional products and services in which the customers have already demonstrated an interest. As they wait to speak to an agent about changing their phone plan, why not display the full range of plans available? Happy customers are not only loyal customers, they’re also customers who respond better to upsell and cross-sell opportunities. Enhance the effectiveness of outbound sales agents. 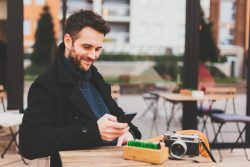 Instead of making cold calls that have notoriously low rates of conversion, through an automated digital engagement system, less intrusive visual notifications can be sent out that invite people to consider your products/services, give people the opportunity to renew policies or address changing regulation standards. These outbound digital marketing efforts reduce the number of hurdles to conversion with the ability to complete transactions on the spot and provide their signatures in real time. Furthermore, the omnichannel environment increases brand stickiness and engagement opportunities as it has a greater visual presence throughout multiple digital channels. Digital solutions can also include organizational information that is commonly requested by callers, leading to faster solutions and a reduction in handling time. The result is increased revenue and decreased service overhead. What’s not to like? Finally, customer experience is a differentiator, and call center automation facilitates more positive customer engagements while applying processes that are far more lucrative. Digital is not companies running away from customers, but rather running toward them, with open and more effective and cost-efficient arms. With digital, companies have found a new way to make their interactions with customers more personal and more satisfying.